What is HD Finishing Powder? By now, everyone knows of the existence of HD powders, but not a lot know why they're called HD powders, and how they're different from other finishing powders out there. I'm here to shed a tiny bit of light on this, as well as to share and compare the performance of some of the HD powders I've tried before. High Definition powders are one of the most recent releases in makeup land, and was formulated as the solution to HD television technology, hence its name. It is mostly made of silica powder. The powder is very, very finely milled, so a little bit goes a long way when it comes to HD powder. Generally, most HD powders are colourless, but some companies have produced coloured versions of these powders, which you will see later on in this post. The new, high definition TVs bring stark attention to flaws in the skin, so makeup had to provide a solution to counter that effect. Enter HD makeup. In general, finishing powders set your makeup. They keep your makeup in place, and absorb some of the excess oil in the skin. HD powders, along with all HD formulated makeup, contain light diffusing particles, which soften the focus of the cameras on the skin and create a 'soft light' effect, hiding to some extent the flaws in the skin, and giving the skin a more glowy effect. If you'd like to see HD makeup in action, here's a YouTube video where I show you how to use HD makeup. A word of warning: a tiny bit of powder really does go a long way, and this powder is completely invisible to the naked eye. You won't know if you've used too much, unless you take a photo of yourself with flash. Make sure you apply with either a fan brush or a kabuki brush, because these products disperse the powders loosely enough so that they won't flash back on camera. Why do I need HD powder? 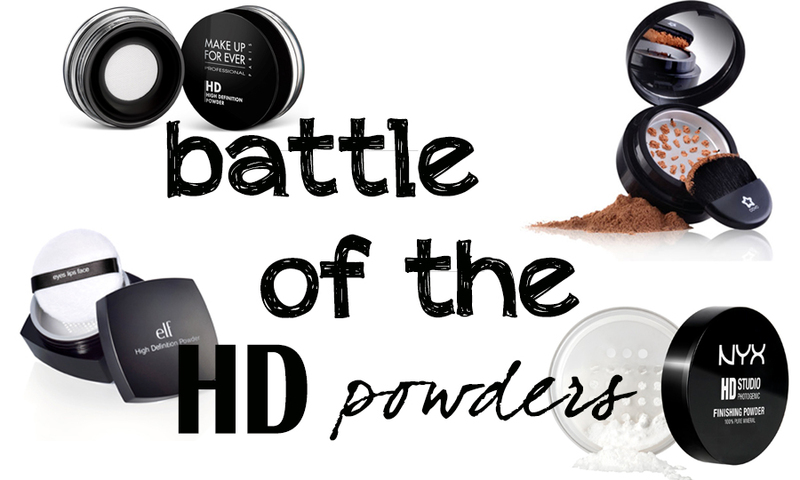 Which HD powder should I use? This is one of the most popular HD powders out there, and the pioneer brand for HD makeup. The powder comes in two forms (as of March 2014) - a loose powder version that comes in a jar with a sifter, and a compact powder version. The Make Up For Ever HD powder is 100% silica powder, and is extremely fine. Only the tiniest bit of powder is needed to set your makeup and create that 'soft focus' effect. It gives your skin the most beautiful glow in photograph and is definitely a powder that lives up to its name and fame. One thing I don't like about the powder though, is how little you need to use in order not to get that white-powder-flashback effect. In warm climates, makeup tends to move around, and I need more powder to set certain areas in my skin, particularly my undereye area. Unfortunately, using too little doesn't set my undereye concealer, and using too much creates that flashback effect. Their HD powder is one of those powders that contain colour pigment, and is less finely milled than the MUFE HD powder. It comes in a compact that contains a grinder, and grinds out loose powder as you turn the grinder. If you're someone who thinks that they need a little more coverage after foundation and concealer, then this is the powder for you. It has a medium coverage, and comes with a convenient little brush (that is actually quite usable!) that you can use on the go. This one is not 100% silica, so it's not as difficult to use as the other HD powders and you're in no danger of over-applying. NYX is an affordable but effective brand, and I have loved almost every product that I've tried from this brand. Their HD powder is no exception. It is 100% silica and finely milled (though admittedly, it doesn't have the smooth, silky feel of the MUFE powder). This is slightly more difficult to use than the MUFE HD powder because if you over-apply, the effect is much more obvious - probably because the powder is slightly less fine compared to the MUFE powder. It still does give your skin that lovely glow if applied properly, plus it is so affordable (I got mine on eBay for $13). This is another one of those affordable powders (I got mine from iherb.com), and is lovely to use. It is more or less identical to the NYX powder, except for the sifter that dispenses the powder. I absolutely love the one in the elf packaging because the holes are smaller, so that the powder doesn't all spill out at one shake. The elf powders also come in a few formulations - one shimmer, one translucent, and one yellow colour-correcting, so they're a little different from the Covo powder.